‘Mining tar sand will destroy Govt’ read the headline in April of 2012. The statement was made to Trinidad and Tobago’s Express newspaper by well-known environmental campaigner Dr. Wayne Kublalsingh to the news that Prime Minister Kamla Persad-Bissessar had made statements about working with Canada’s Harper Government to start development of tar sands for oil in Trinidad’s southwest peninsula. ‘Mining tar sand will destroy Govt’ read the headline in April of 2012. The statement was made to Trinidad and Tobago’s Express newspaper by well-known environmental campaigner Dr. Wayne Kublalsingh to the news that Prime Minister Kamla Persad-Bissessar had made statements about working with Canada’s Harper Government to start development of tar sands for oil in Trinidad’s southwest peninsula. If anyone could make such a bold statement stick in Trinidad and Tobago, it would be Kublalsingh, a veteran of multiple struggles against what he and community members believe to be ill-advised industrial projects. Oil is hardly new to the twin island nation. Trinidad was among the very first oil producing countries in history. Industrial developments have been the driving force of Trinidad and Tobago being the richest country (per capita) in the Caribbean. However, concerns over environmental and social impacts have led mobilizations that involved Kublalsingh to ultimately prevent the construction of two aluminum smelters, a steel mill, and proposed industrial ports. Over the last couple of years, perhaps the greatest test for the current coalition government has been the Highway Re-route Movement (HRM). HRM is a group made almost entirely of families fighting eviction, as well as wetland disruption, for a segment of an industrial highway into the oil-rich region. Officially independent in 1962, Trinidad and Tobago was still dominated by Canadian banks by the end of the 1960s and into the 1970s. Today, Canadian banks Scotiabank, CIBC, and TD all have returned to large-scale involvement in the country, while Canadian banks in general have historically been regarded as colonial and often racist. Events in Montréal involving Trinidadian students at Sir George Williams University highlighted the Canadian connection for many involved in the Black Power Revolution of Trinidad and Tobago from 1970. During the struggles against neo-colonialism and racism, one of the ongoing targets of the revolutionaries in the country was a series of fire-bombings of Canadian Banks that had white or near-white employees almost exclusively in the very non-white country. The fire-bombings ended when banks initiated quotas on hiring practices and other localized reforms took root. Perhaps, then, it is surprising that expanding Canadian bank influence today draws scant criticism. The Royal Bank of Canada (RBC) bought the Royal Bank of Trinidad and Tobago in 2007. This made RBC–the world’s largets financier of tar sands development–the second largest financial institution in the country, while also setting the stage for possible mining of the tar sands near La Brea in the southwest of Trinidad. Tarsands outcrop on land and even directly into the ocean naturally where they occur. Across the territory of Trinidad, exploration conducted decades ago estimated some 1.5 to 2 billion barrels of bitumen-based fuel. Vessigny, Guapo, Parrylands, Vance River, and La Brea all exist directly on top of tar sands deposits. Far from sparsely populated and across vast regions of a giant country like Canada, the tar sands region of Trinidad and Tobago is densely packed with people who have lived in the region for generations. Yet in the years since RBC moved into the country development has inched closer and closer to reality. During the internationally famous festival of Carnival in February of 2009, the then-People’s National Movement government announced that Petrotrin (the national petroleum company) had signed an exploration permit for tar sands. Having made this announcement while most Trinis were otherwise occupied seemed to limit discussion of potential tar sands to between governments, corporations and investors—with a minimum amount of public discussion. Anslim Carter, a resident of La Brea who lives about a two minute walk from tar sands outcrops at the surface, further explained to Upside Down World the lack of clarity among the public. “They have been all hush-hush, they have not carried out consultation with the people like they are supposed to do. That’s the problem we have here,” said Carter. He should know. A community organizer who helped coordinate resistance to the smelter planned for his region, Carter showed me the local homes built on faulty ground because of the bitumen, locally referred to as “Pitch,” referencing the material from the world renowned asphalt lake of the same name that lies just over the hill from the previous proposed smelter site and a possible bitumen upgrader site currently. People living in houses that are sinking into the bitumen-rich earth had heard little to nothing from the local government about possible tar sands development. However, that does not mean that the local government has not spoken about tar sands in Trinidad to international developers. Speaking to either local business elites, foreign journalists, or foreign governments, Trinidad and Tobago government officials have been pushing for tar sands development. This seemed to escalate after the establishment of the People’s Partnership coalition government in 2010. “We know there are environmental challenges to the mining of tar sands. But we also know there are players in the international marketplace who have been successfully mining tar sands in a safe and environmentally acceptable manner, for the production of synthetic crude,” said Carolyn Seepersad-Bachan, Minister of Energy and Energy Affairs (Congress of the People) in early 2011. That same day, Petrotrin published preliminary plans for possible 600-foot deep open pit mining, roughly three times deeper than any in Alberta, Canada, and deep enough to bury any building currently standing on land in Trinidad and Tobago, including Port-of-Spain’s skyline defining Hyatt. Shortly after, the Royal Bank attended events organized by the local Environmental Management Authority [EMA] and spoke openly of community “consultation” methods developed in Canada’s “oil sands sector.” This coincided with a joint-environmentalist and Royal Bank statement about honoring indigenous rights in Canada. RBC never defined nor established a mechanism to enforce these statements, but the campaign calling for the largest tar sands investor to divest was ended. It may, in fact, be even more related than just controversy. The Highway Re-Route Movement, a movement representing some more than 300 Trini families whose homes are to be forcibly evacuated to make way for a twin-highway into the Point Fortin area west of the bulk of tar sands, whether by design or by accident would facilitate tar sands extraction, linking up the recently retrofitted refinery north of San Fernando to the Union Estate, the centre point near the tar sands and the Pitch Lake. It was in 2012, however, that Dr. Kublalsingh made his comments at the outset of this article, responding to reporters asking for his take on prospective Trinidad and Tobago tar sands development. Later that same year, his work with the Highway Re-Route Movement would see his undertaking a prolonged hunger strike in front of the office of the Prime Minister, who steadfastly refused to meet with him or the families to be affected. The hunger strike only ended when a proper environmental review was promised to be undertaken; it has since not been honored or upheld. In Cartagena, Colombia Trinidad and Tobago government officials and Canadian representatives spoke publicly about collaborating on bitumen oil development in Trinidad, signifying a first discussion of this vital issue for many across the twin island nation. Still, while bulldozers raged towards the homes of people living in the pathway of the ecologically devastating highway (proponents of a re-routing of the highway note damage to waterways, annual flooding and the loss of important mangrove areas as direct impacts of building the eastern section on the government’s current route), almost nothing had escaped into the public sphere regarding possible tar sands developments in the country. Such a pattern of decline in the vital industry has defined a cause in which Mr. Ramnarine has become a crusader. With the price of oil internationally high, the Energy Ministry has turned its attention both to heavy oil on land in south Trinidad and in the Gulf of Paria, and to the tar sands located in some 13 square kilometres also in the deep south. Meeting Canadian Prime Minister Stephen Harper at the Americas Summit in Cartagena, Prime Minister Kamla Persad-Bissessar and Mr Ramnarine described T&T as a tar sands frontier in the making. Despite these strong, pro-development words, Ramnarine has sought to play down their significance in the time since the FTAA summit and instead has dodged the issue much as described by Suhku. After further investigation of the matter, Ramnarine spoke on tar sands in August, stating to Guardian reporter Zahra Gordon that Trinidad and Tobago had “no plans to develop the country’s oil sands,” while refusing to comment on Prime Minister Kamla, Ministry of Energy predecessors Seepersad-Bachan, or the PNM’s Conrad Enil, all of whom have seemingly contradicted him. Instead, the facts on the ground suggest the prospect of tar sands development is advancing in Trinidad and Tobago. A small island-based country with no major river systems, tar sands development could currently be encouraged by a new desalination plant constructed near Point Fortin in the south of the country. This opened in the summer of 2013. Similarly, north of the main tar sands deposits outside of San Fernando is the recently re-furbished Point-A-Pierre refinery, a refinery that has been running well under capacity for years, recently underwent a major upgrade and can now handle bitumen into synthetic oil production. Also recently finished and now operating is a large power plant supplied by natural gas, an energy source which could assist any tar sands development with the very large energy needs to process bitumen into synthetic oil. And, once again, the recently upgraded refinery is also connected to the tar sands region in what is called the Union Estate by the stretch of the Point Fortin Highway that has been resisted by families involved in the Highway Re-route Movement and Kublalsingh. Within the Union Estate is also a plan for a large bitumen upgrader, signed by Ramnarine with giant Indian corporation Reliance. All of these industrial developments may exist for reasons other than tar sands mining. However, every single one of these makes tar sands mining possible, where without them such development as mining would be much more difficult. His comments appear to be at odds with others of his own. Asked what he thought of this quiet announcement from the MEEA, Anslim Carter of La Brea said, “It is not a surprise to me, but it would be to a lot of people.” Kublalsingh was more harsh is his assessment. “This is another case of government, and more precisely the Ministry of Energy monetizing natural resources as they tried to do with the smelters, the steel mill and industrial ports, in order to better re-distribute these resources to foreign corporations, local corporations as well as family and friends of this government. This is a tremendously disruptive assault on our natural resources,” concluded Kublalsingh. All of this was before the first big “push” came publicly in the Trinidad mainstream press. On April 8, 2014 David Renwick offered new information about the current status of tar sands, and as some have feared, it is closer to development than previously made public. There is a company now with a license to prepare the ground for tar sands mining. As Renwick alerted Trinidad, “[T]he tar sands initiative is actually being pursued by another company, Geominex Tcos, in which Geominex Resources holds 20 per cent and Trinidad Canada Oil Sands (the Tcos part), 80 per cent.” He then explains that TCOS is the remnants of Western Oil Sands of Canada, a company from Calgary that once held a tar sands exploration permit for Trinidad. That permit was granted during the Basdeo Panday administration, and terminated with the sale of Western Oil Sands to Marathon Oil from the US. 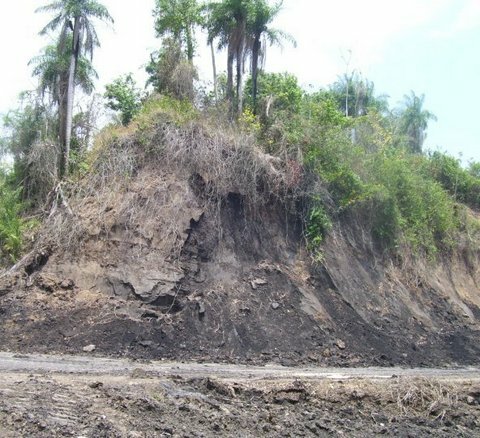 The Canadian tar sands experts from that company now seek to begin the work in Trinidad, as majority owners. The role of Canadian capital, it would seem, is returning to that of the 1960s in Trinidad and Tobago. It is fitting that Canadian support for tar sands development in Trinidad and Tobago became public during FTAA talks, as similar agreements around trade, finance and more would help streamline any plans Canadian tar sand producers, investors, and lobbyists have in promoting tar sands in Trinidad. Canada and Trinidad, as well as the rest of the CARICOM (Caribbean Community) countries are re-negotiating a free trade treaty to replace one that expired December 31, 2013. Instead of divestment as has targeted RBC in the recent past, the Harper Government has invested in tar sands advocacy in Europe, with the intention of trying to prevent any legislation or treaty that would “unfairly” target tar sands from Canada. Whether pushing for TransCanada’s Keystone XL in Washington, or against the Fuel Quality Directive as it would apply to the European Union imports, when it comes to bitumen, Canada is the clear leader of an attempt to normalize extreme energy that would make any hope of climate stabilization before impending chaos near impossible. To normalize tar sands developments in Canada as an untouchable part of the global energy grid has been a consistent Harper government goal. Investors, too, would like to be certain of the stability of tar sands finance. International expansion of tar sands developments could hard wire bitumen into the global energy grid in a fashion that is similar to what has been taking place with the breakneck expansion of fracking technology. Having shown up everywhere at once has made resistance to it more daunting. The glimpses into what is being proposed on the southwest Peninsula of Trinidad have been put out there, stripped of all the rhetoric of reclamation, water recycling and so on, that we in Canada are already sadly familiar with. Those lines are most likely coming from the same PR team in Canada spending millions of tax dollars promoting tar sands development. The memes “progressive restoration model” or “small footprint model” are being spread. This is exactly what Canada is already doing, however that is destroying the climate, the land, the water and countless human lives in the process. It hasn’t begun yet in Trinidad and Tobago, which makes the need for open, public debate in the Caribbean nation that much more urgent. Macdonald Stainsby is a freelance writer, social justice organizer and professional hitchhiker looking for a ride to the better world, based currently in Vancouver, Canada. He is also the coordinator of TarSandsWorld.com and OilSandsTruth.org.